Yesterday's groundbreaking ceremony for the Cambridge and Somerville Program for Alcohol Rehabilitation shelter was "not only a groundbreaking, but a new time to be celebrated by" Cambridge and MIT, according to Richard Brescia, chair of the CASPAR board of directors. About 110 people attended the ceremony at the 240 Albany St. site. On March 1, the Cambridge City Council voted to approve an agreement where MIT would build a permanent facility for the CASPAR shelter at the Albany Street site, at the cost of $1.9 million. In exchange, MIT received ownership of one street and obtained the lease of three other streets and sidewalks around campus. The shelter, which serves homeless individuals with addiction problems, had been searching for a permanent location for 14 years. Since 1979, the emergency shelter has been housed in two trailers on the Albany Street site. The land is owned by MIT and leased to CASPAR rent-free. According to MIT and Cambridge officials, yesterday's event symbolized a new era of relations between Cambridge and MIT. CASPAR is grateful for the permanent site and feels it has been a "catalyst for this communication" between Cambridge and MIT, Brescia said. O. Robert Simha MCP '57, director of planning, called the agreement "a wonderful step in the right direction of a relationship between MIT and Cambridge -- an important new gateway." The ceremony was open to the public. Several community and city leaders were present, including Cambridge Mayor Kenneth E. Reeves, President Charles M. Vest, Cambridge City Manager Robert W. Healy, president of the Central Square Neighborhood Coalition, city councillors, and the Massachusetts public health commissioner. Brescia oversaw the event. "It was so refreshing just to see many people of the community. ... it was overwhelming," Brescia said. Simha said the event was wonderful and well-attended. "The atmosphere was very warm, very congenial," he said. "Everyone spoke warmly about MIT [including] Mayor Reeves and the mayor of Somerville," Simha said. "It would have been an event that anybody at MIT would have been pleased to have attended." "Many other communities would never have the dynamic we've had to go through all the gyrations to get a solution that is win/win," Reeves said at the ceremony. "President Vest is to be congratulated for his vision and his understanding of the nature of community. With his leadership MIT and Cambridge have joined together to address the problem of shelter and safety for troubled members of our community," Reeves said. "The city applauds the efforts of neighbors, MIT, and members of the city council" who served on the sitting committee that approved the agreement. 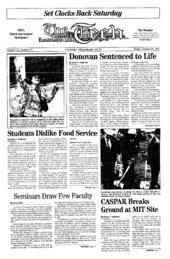 "It is not the ordinary mission of a university to find a site and finance a building for a health and human services agency such as CASPAR, but MIT had been committed to CASPAR for 14 years, and it was clear that the Cambridge community wanted the services of CASPAR," Vest said at the groundbreaking. "We hope that the building will be complete by May or June," Brescia said. CASPAR is still operating out of the temporary trailers right now, he said. MIT will lease the building to CASPAR for $1 per year for 20 years, with an option to renew the lease for another 20 years. CASPAR will pay MIT $1 a year for the site, while MIT will pay Cambridge $1 a year for each of the streets. The agreement specifies that MIT may make improvements to leased streets but must preserve public access to them. Cambridge transferred ownership to MIT of part of Amherst Street and leases for Carleton and Hayward Streets, and a portion of the sidewalks on Vassar Street. MIT also received two easements to build bridges or tunnels across Carleton Street and a third easement for a bridge or tunnel across Hayward Street. MIT will retain possession of any street-spanning structure when the lease on the streets expires. At the ceremony MIT and Cambridge received "recognition for the creative way of resolving this problem," Simha said.